Get up close and personal to the Emerald City on this private sightseeing tour of Seattle’s highlights. On this personalized tour, decide between must-see attractions including Pike Place Market, Pioneer Square and the Ballard Locks, as well as Chinatown and other diverse neighborhoods that give Seattle its character. Choose from popping into local art galleries, grabbing coffee from the original Starbucks, browsing the vendors at Pike Place, or soaking up sweeping views of Puget Sound, Mt Rainier and the Olympic Mountains from the iconic Space Needle (admission not included). Your private guide will provide commentary on the sights while showing you the best places for food, shopping and entertainment. By the end of the tour, you’ll know Seattle like a local! You’ll be picked up from your downtown Seattle hotel at your pre-arranged time to start your private sightseeing tour of Seattle. Your friendly, knowledgeable private guide will take you on a comfortable drive by van through the city to the sites of your choosing, offering commentary along the way. You’ll have plenty of time to hop out, walk around and soak up the atmosphere of each place on the tour, which can be tailored to suit your tastes. If you'd like, cruise through Chinatown-International District and hop off to visit Pioneer Square, a historic neighborhood that was once the heart of the city—Seattle's founders settled there in 1852. Take a leisurely stroll past charming boutiques, quirky shops and great cafes as your guide points out the Renaissance Revival architecture. Or choose to head to Belltown, the city’s most populated neighborhood, and hop out to explore world-famous Pike Place Market, Seattle's original farmers market home to a ton of vendors offering everything from locally sourced produced and artisan foods to specialty souvenirs and used books. Soak up the buzzing atmosphere as you browse the market and see the famous flying fish. If you like coffee (Seattle’s most famous drink), cross the street to grab a coffee at the original Starbucks! You can also visit some local art galleries. Just north of Belltown lies that iconic Space Needle, another possible stopping point on your customizable excursion. You'll have time to hop out here, purchase a ticket, and whiz up to the top floor for incredible 360-degree views of the sparkling waters of Puget Sound, towering Mt Rainier, the Cascade and Olympic Mountains and the Seattle skyline. After soaking up the views, continue your drive to your next desired location, which could be Queen Anne Hill, a neighborhood that sits on the highest hill in the city. Camera in hand, admire beautiful city views from the lookout point. If you'd like, continue to the Ballard Locks (known formally as the Hiram M Chittenden Locks) at the west end of Salmon Bay. Your guide will explain the engineering feats behind this complex of locks, which links Puget Sound with Lake Union and Lake Washington. Here, you’ll also see the famous fish ladder, built to allow salmon to pass between fresh and salt water. Other possible stops include Fisherman's Terminal, the Elliot Bay Waterfront, Safeco Stadium, Qwest Field and Olympic Sculpture Park before heading back to your hotel. 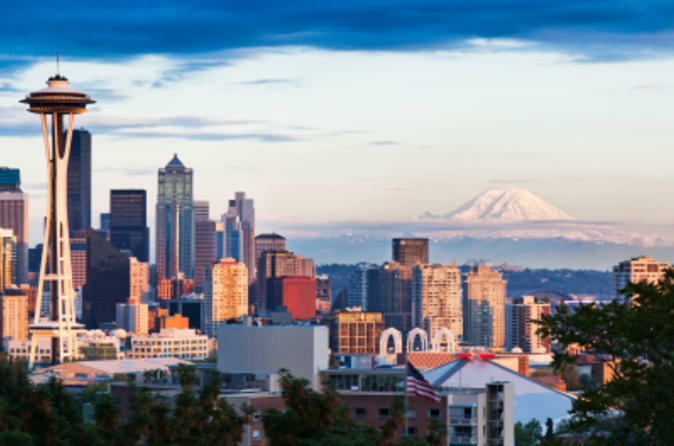 By the end of the day, you’ll know Seattle like a native—its history, its legends, its many fascinating sights and all the best places for food, shopping and entertainment!